emily lam | blog: Mmm! Chicken Noodle Soup! Remember Half-Recipe Wednesday? Well, I deem today, September 15th, 2012, Soup Saturday! So get out your cookware and make your favorite soup! In celebration of Soup Saturday, I made Chicken Noodle Soup. Mmm! In the mug is Kool-Aid. Haha! Chicken meat – I think I used two breasts, or was it two fillets, I'm not exactly sure . . . Okay, so first, I made the chicken broth. This is where things went kind of unplanned. See, I had forgotten to thaw the chicken meat. So my two chicken breasts, or fillets or whatever, were frozen together. I read online that you could still cook frozen chicken, it would just take double the time. So I kind of just tossed the chicken in a small pot with water and turned the stove on at high. As the water boiled, I tried my best to pry the two pieces of chicken apart. As I was doing this, the film of fat that forms at the top of the water when you boil chicken formed. And there was just a lot of it. I tried to scoop it off the way I've seen my mother do it. But it wasn't working. So I just dumped all the water out, along with the fatty film, and put in new water and reboiled the chicken. During this second boiling, I finally got the two pieces of chicken apart. But then I realized that I was using the wrong pot. I was using some nonstick pot instead of my soup pot. So I basically scooped out whatever new film of fat that was forming that I could and poured the chicken and water into my 3 quarts soup pot. I then proceeded to fill the pot to about two-thirds full, or maybe a little bit more, three-fourths. Next, I just left it there to boil and cook. In the end the soup was very clear and tasty, so I don't think this process was entirely bad but it probably should be avoided. The rest of the cooking went smoothly. While the chicken was cooking. I peeled and diced my two carrots. After that, I poured the diced carrots into the pot to cook with the chicken. I then turned the dial on the stove to medium so it wouldn't boil over and added salt to the broth. Next, while the broth continue to cook, I got another pot, and cooked and strained one serving of pasta. I don't really like my pasta mushy so I keep it separate from the broth in a bowl. 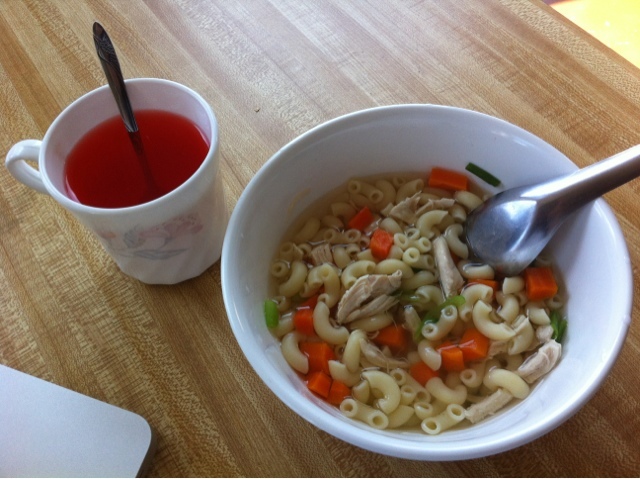 After I was satisfied with my chicken and carrots broth, I took a piece of chicken out of the broth and peeled it into smaller pieces and added to the bowl with the pasta. Next, I poured one serving of broth along with some carrots over my pasta. I then added some chopped scallion and black pepper for favoring. And ta-da, done! One serving of Chicken Noodle Soup. I still have about two quarts of broth left. So I think it's safe to say I can make two more servings of Chicken Noodle Soup, when I feel like it. Of course I would need to cook a serving of pasta for each serving quart of broth. So for a total, with the ingredients I listed above, you can make three servings of Chicken Noodle Soup.